One or more photo(s) has been virtually staged. 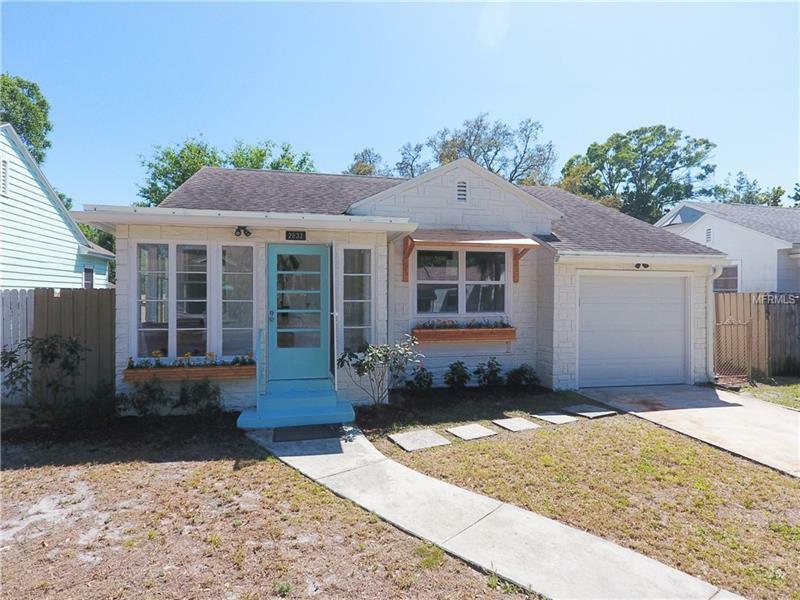 Vintage cobbled cottage in Historic Kenwood within eyeshot of Seminole Park. This (2) bedroom (1) bathroom cottage stands out among the neighboring bungalows and features a large covered rear porch, spacious back yard with large deck patio and an uncommon front entry garage and driveway. Tastefully renovated, you're met with tremendous amount of natural light in the front tiled foyer, followed by an open floor plan where the living rooms spills into the spacious kitchen. The kitchen is complete with wood cabinets, stainless appliances and granite countertops and has plenty of storage for all of your cooking gadgets. The new bathroom has a classic look with monochromatic subway tile and designer floor tile. French doors open up from the rear of the home into the big fenced in back yard and 20ft long patio covered for 7ft then expanding an additional 10ft via deck. The back yard is perfect for outdoor dining, entertaining and is spacious enough for a private Garden or Pool. Historic Kenwood flows with artistic design and a prideful homeowner's association that host multiple events like Pinot in the Park, porch parties and Bungalowfest and Easter egg hunts. Even better, you're only a short walk to great shopping and fantastic restaurants in the Grand Central District and only a short drive to downtown and the beaches. Commuters will love the proximity to I-275 as well. This home won't last long! Check out the 3D tour online.